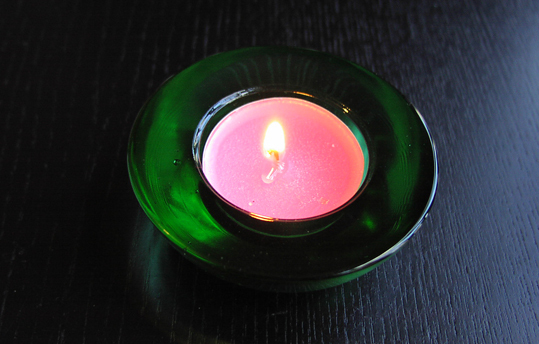 A bad witch's blog: Candle Magic: Pink or Green for Love Spells? 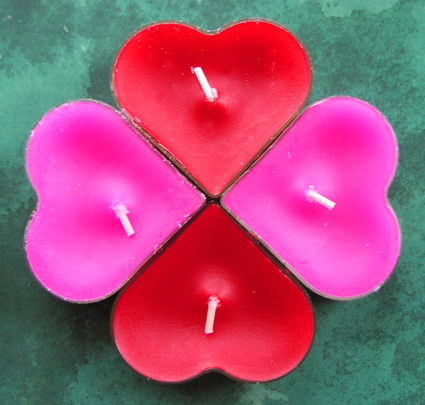 Candle Magic: Pink or Green for Love Spells? At one time, green was the colour of love. To most people today, that probably seems a bit odd – especially at a time when pretty much every shop window is splurged in pink for Valentine’s Day. Even for modern witches considering candle spells to conjure up a bit of romance, a pink or red candle is probably the first thing that comes to mind, but dig a little deeper into esoteric symbolism and the colour of love magic changes. The modern English word green comes from the Middle English and Anglo-Saxon word grene, from the same Germanic root as the words "grass" and "grow". It is the colour of grass and leaves and for this reason most of us associate it with springtime, nature, growth and life. And, to be honest, it has had this symbolism for thousands of years. For Ancient Egyptians, green was the colour of growing crops and became a symbol of regeneration. Osiris, the god who represented rebirth, was painted with a green face. The Roman goddess of gardens and vineyards was also usually shown dressed in green – but when you realise that the goddess of gardens was also the goddess of love – Venus – you begin to see why green is good to attract a passionate suitor bearing wine and roses. Add to that the fact that the goddess Aphrodite, often considered the earlier Greek version of Venus, was born of the sea and the connection becomes more obvious – even if Homer did confusingly describe the sea as wine dark rather than blue-green in his epic poetry. Moving on to medieval European poetry, light green was a term often employed by troubadours when describing the colour of growing love and also the clothing of eligible maidens. Then going east to India, green is the colour of the heart chakra. In the eastern system of energy points in the body, the heart chakra represents the place of compassion, tenderness, love, equilibrium and well-being and is depicted as a green flower. Green also has some more dubious links with desire and temptation. It was the colour of the serpent in the Garden of Eden who offered Adam and Eve the fruit of knowledge, and the expression "green-eyed monster" was used by Shakespeare in Othello to describe destructive envy or jealousy. Pink, on the other hand, while nowadays being a very common colour and most associated with love and beauty, wasn’t used that much in history. The Ancient Greeks described the colour of dawn as “rosy” and Christians saw it as symbolising a pure, spiritual marriage, but in general it was just a colour used by artists for painting hands and faces. In general, people preferred brighter colours until the 18th century when pastels suddenly came into vogue. Nevertheless, pink still didn’t get fixed as a colour symbolising love. In fact, in 19th century England, it was often worn by young boys because it was a lighter shade of manly red. It wasn’t until the 20th century that pink – especially bright pink – became associated with eroticism and seduction. 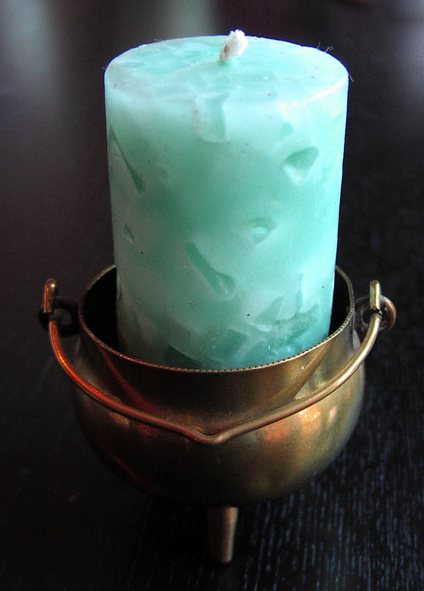 So, going back to what colour candle you should choose if you are planning some love magic for Valentine’s Day. Do you now choose pink or green? Bearing all that in mind you can see some of the reasons why green has been the colour of love for longer than pink. However, when I do love spells myself, I am happy to admit that I usually choose pink candles. Nevertheless, I often put them in green or copper candleholders to combine traditional and modern associations. My advice is to go with whatever colour feels most appropriate to you personally. Magic comes from the heart and if your heart says pink rather than green, go with it. You can read more about colour correspondences for candle magic in my book Pagan Portals - Candle Magic: A witch's guide to spells and rituals.